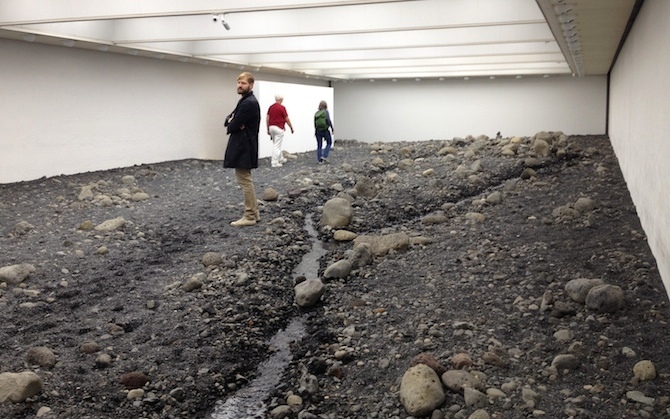 Where De Maria used dirt, Eliasson uses stones. Icelandic stones, to be precise. And one may sense a change of air and atmosphere inside the re-created stonescape of Louisiana, too. 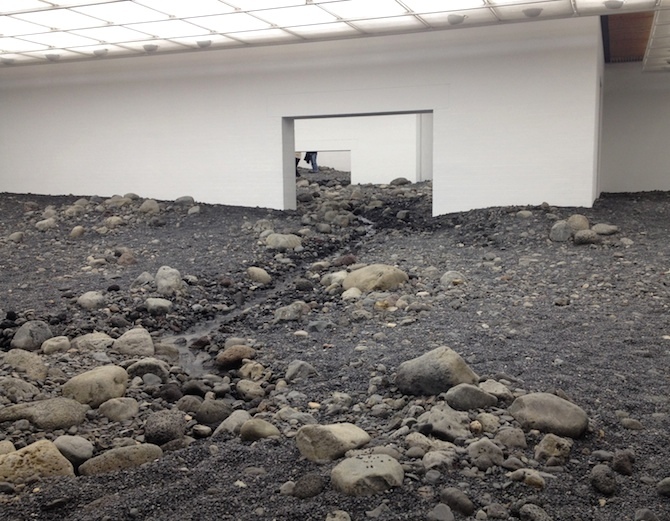 Is "Riverbed" thus an update of the "Earth Room"? 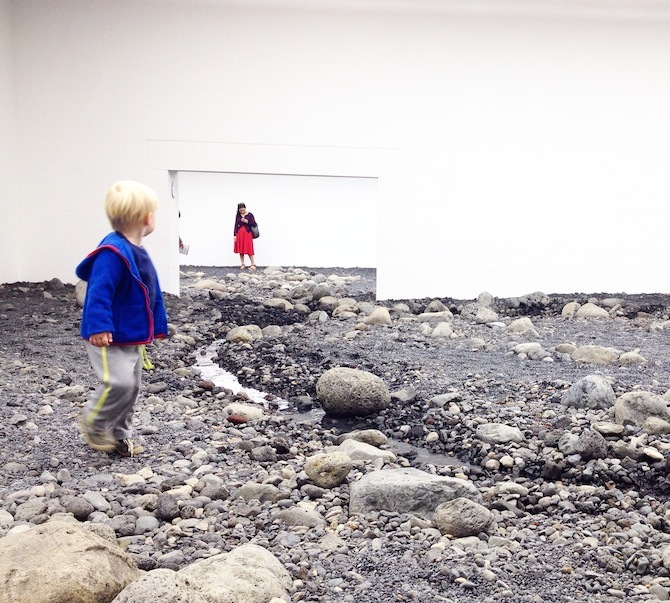 People have often assigned a spiritual experience to De Maria's installation. 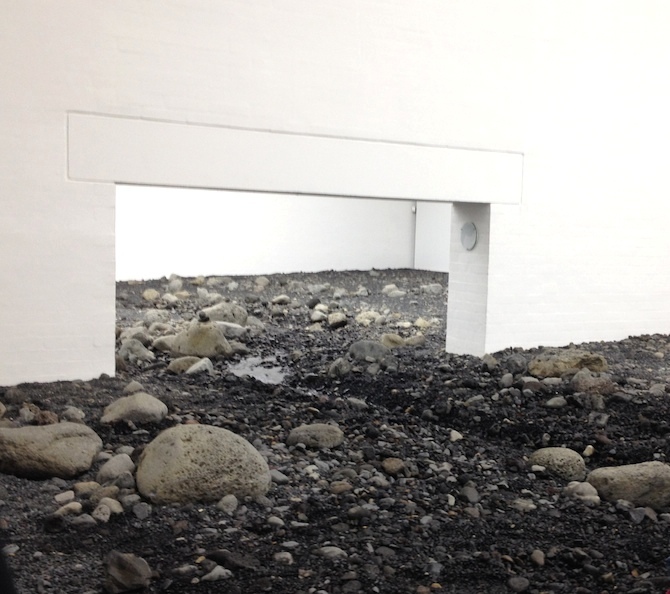 But does spirituality have the same position in Eliasson's work? When closing the eyes, the sound of the other visitors' creaky movements takes the mind to a place that is far away from art and institutional white cubes. 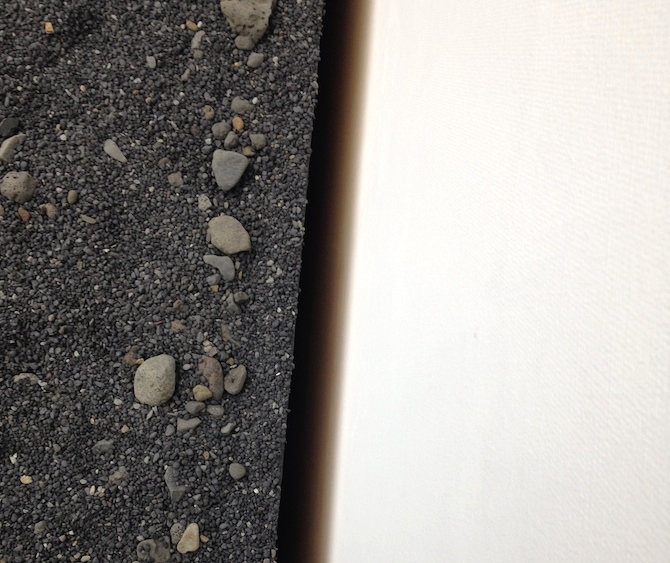 It is a meditative and reflective process that is stimulated by the manipulation of clean space. Visitors watch their own movements, trying to balance themselves through the path they choose to walk. 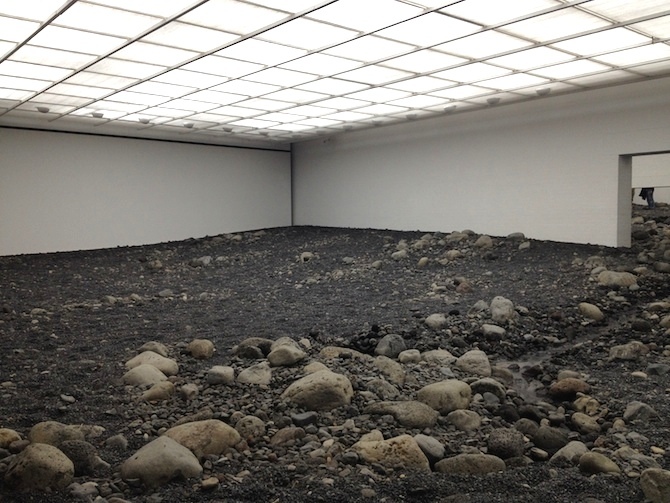 The most interesting part of "Riverbed", however, is neither its illusionary, nor its participative experience, but rather the disappointment (I would even call it frustration) caused by the discomfort of being surrounded by windowless walls that look nothing like a horizon. The white walls' blankness, which Anne Raver points out in her text, functions as a latent reality-check. 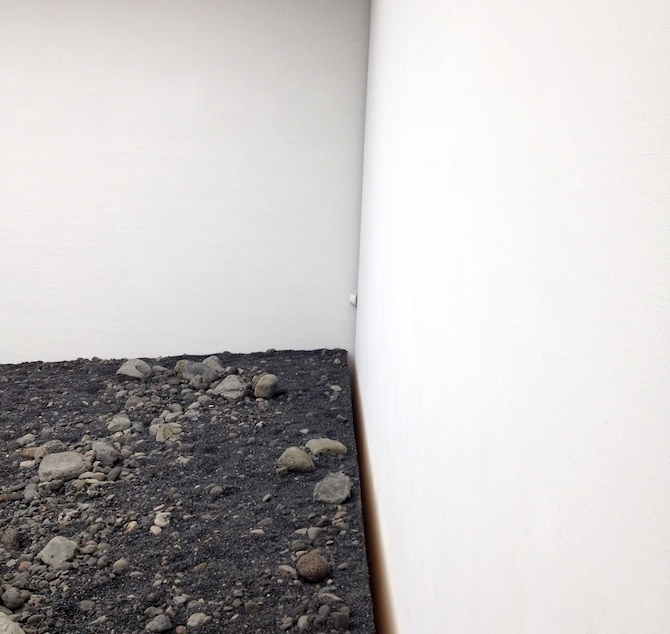 Once the giant plastic tubs filled with stones approach these walls, a distinct gap reveals the construction underneath and thus the artificiality of the naturalistic landscape. 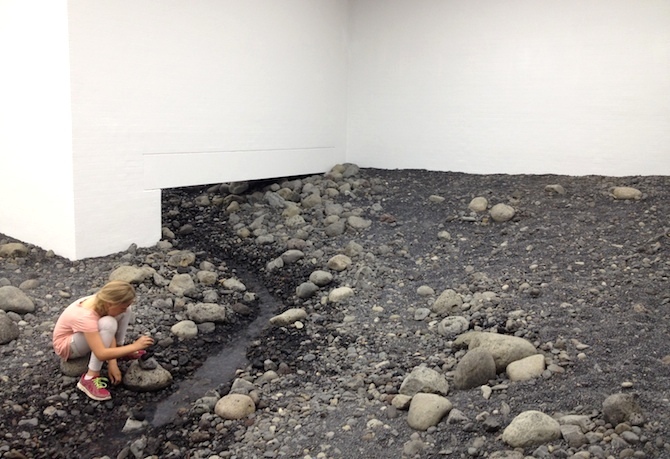 According to Elliason, "there is no romance involved" in "Riverbed". "Not a god, but people made this," he says. This is the distinction between his and past artists' agendas of bringing nature into an institutional context. The exhibition does not feature a spectacle of sublimity. It rather poses an open question to our individual relationship with nature, and how we want to experience it. Above all, the installation has a repelling effect: it triggers a longing for escaping the claustrophobic white cube and to step outside. To see a horizon, which, at least at the coast just in front of Louisiana Museum, is pretty romantic.